A home buying decision depends to a great extent on the amount of Home Loan you can avail. But before you decide on borrowing, do keep these important things before applying home loans in India, in mind. Not saying that the real estate is affordable, if anything for a majority it is a dream and especially in metros like Mumbai, it is at criminally high prices. But that’s another story. For those lucky ones to land an affordable deal, home loans are the other major hurdle they need to cross before they can get the keys to their abode. Getting home loans involve a lot of paperwork and documentation and it can be time consuming and exhausting to hunt for a home and also apply for a home loan. The main factor that influences home loan from a borrower’s point of view is probably the EMI, the monthly outflow that will go towards repaying your loan for the at least the next 10-15 years. Do not over stretch yourself; thinking that you are bound to earn more in the future so you can push a bit and get more loan and hence take on additional EMI. As a golden rule never let your EMI exceed 40-45 % of your net monthly income. If you earn more, you can always pre-pay your loan with additional disposable funds as most banks do not have pre-payment penalties now-a-days. Once you know how much EMI you can afford, you need to check how much you can contribute from your own pocket. You will need to contribute at least 20-25% of the property value you choose. No bank will give you 100% home loan. If you need to buy a property worth 25 Lac, bank will at the most grant a home loan of Rs. 20 Lac, the remaining 5 Lac you will have to arrange. Also check your home loan eligibility, whether or not you can get the amount you seek in the first place. Any difference in the loan amount will also be going from your pocket or you will have to cut down your overall budget. One more important thing is the fact that a lot of seller’s demand some percentage of deal in cash or known as black. This is off the records and banks will not cover this. So beware of dealing in black as well, this will too be borne by you. This is where you will need to decide between lower EMI at start and higher interest payment or lesser term and higher EMI but lower interest payments. If you need a higher loan than what your EMI affordability allows you, you can opt for a longer tenure. This will reduce your EMI and banks may grant your higher loan amount. However you will pay more interest in the long run, but you can get the loan at affordable monthly cost today. In this case you can still cut down the tenure by pre-paying the loan. Any future raise in income can be consolidated and used in lump sums to pay off the loan before the tenure as pre-payment penalties are almost non-existent now. This is the trickiest. Home loans typically come with two types of Rate of Interest (ROI) fixed and floating. Fixed ROI means that the interest rate will remain constant for a period of 5-10 years and in some cases throughout the tenure of the loan. Floating ROI means that the interest rate can change anytime depending on the RBI norms and various Government policies and market conditions. This can go down than your current ROI or also Increase. Fixed ROI will be higher than the floating ROI at that moment. Fixed ROI should be opted if you feel that the ROI is already on the lower side and the ROI can only increase from here or else floating should be opted. You can always switch between fixed and floating ROI anytime during your tenure, but check about the switching charge that banks may charge; these may or may not apply to your home loan type, yet be sure of it. As such there should be no extra charges except for the processing fees, legal verification charges in some cases, stamp duty on home loan amount and certain switching charges if you were to change your EMI or transfer your loan to another bank or NBFC. However there will be certain penalty if you default on your payment along with added interest in some cases. Make sure you are aware of all these charges and ask the banks a list of charges applicable in all cases in writing; never take their word for anything. There may be some charges for releasing your property documents for photocopying purposes or any other, during the tenure of the loan. This is the most important step you must do once you get the home loan disbursed. Get home loan insurance or get yourself an insurance equivalent to the home loan amount. In case of any unfortunate event, your loved ones will still be able to live in the house and your home loan insurance will pay for the pending loan amount. There are also certain insurance policies that will provide you benefits in the event of disability, loss of job, some critical illness diagnosis for the borrower etc. This cost also should be considered in the overall affordability criteria as it is cost above your EMI. Be aware of all the tax implications as well as tax benefits you are entitled to receive while servicing your home loan. 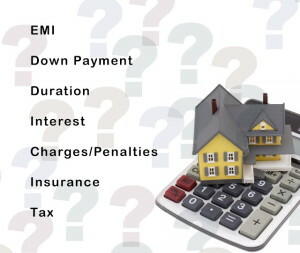 You are entitled to complete exemption of interest on home loan in India you pay, up to an amount of Rs. 150,000 and up to Rs. 100,000 on the principal amount. Avail these benefits. However if you were to sell your property within the first 5 years, the tax you saved on interest payments will be added to your income from sale of property and will be taxed, keep this in mind. Do not rush into any home loan decision just based on any one factor. Always get quotes from 2-3 banks or NBFC and think over the above mentioned factors. Once you have decided on your lender, the affordability and other things, you can go through our complete guide to getting home loans in India which will help you get home loans smoothly and cover the entire procedure of home loans in India as well as the factors that may affect your home loan eligibility, to understand how banks decide on the home loan amount.